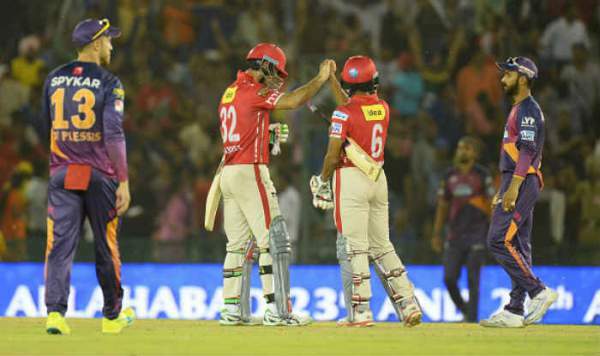 Rising Pune Supergiants vs Kings XI Punjab Live Streaming IPL 2017 Score RPS vs KXIP: Today, it is the debut T20 match for KXIP in the Indian Premier League 2017 tournament. They will play against Pune Supergiants, who have already tasted the victory in their first game and defeated Mumbai Indians (MI). RPS vs KXIP live streaming and IPL 2017 live cricket score details are available here on this page only. It is scheduled to start at 4 pm and the audience can watch it online via desktops, laptops, and smartphones. Moreover, TV viewers can catch it on their television sets and the specific channels mentioned below. Until today, they have played two matches against each other and both won one game each. Watch: Royal Challengers Bangalore vs Delhi Daredevils Live Stream. Today, it will be the third match between them. Toss has been done at the Holkar Stadium and KXIP won it and has chosen to field first. After winning against Mumbai, Pune must be feeling confident at this time. IPL 2017 marks the start of two matches a day with today’s games. The captain of RPS, Steve Smith played his skipper innings and made 84 (not out) from just 54 balls. He made a significant contribution in the seven-wicket victory in Pune with still a ball left in the game to be played. It looked like RPS controlled everything that day. If you remember, Kings XI didn’t enjoy a good session in the IPL 2016 tournament. This time, KXIP will be looking forward to do better and make their name. In 2017, they have a new coaching staff and skipper as well. The new captain Glenn Maxwell needs to do quite hard work now. In India, the audience can IPL 2017 live streaming on Hotstar (both on mobile and computer). On television, they can catch the live updates on Sony Pictures Network. Follow the below-mentioned list of tv channels and websites to watch IPL 2017 online for free (kxip vs rps). # OSN Rights – (MENA Counties) – Algeria, Bahrain, Egypt, Iran, Iraq, Israel, Jordan, Kuwait, Lebanon, Libya, Mauritania, Morocco, Oman, Palestine, Qatar, Saudi Arabia, Sudan, Syria, Tunasia, UAE and Yemen only. # Now TV & Cricketgateway.com – Hong Kong.